Renovation of a bathroom is a serious undertaking, it is worth not only to refresh and update its appearance but also to take the opportunity to use the potential of this room to make it more comfortable and more attractive. When designing a new bathroom, you should take into account the latest trends, stylish colours, solutions found in design magazines or catalogues. This is a good way to arrange a modern and functional bathroom. However, do not forget the basic principle – you are arranging for yourself, so first and foremost you should be pleased with it and feel good here. Only then will you be satisfied with the effect of a renovation. Therefore, before deciding on what equipment you are going to buy, what materials and colours to introduce, answer these questions – what are the needs and habits of household members, who prefers a bathtub, and who prefers a cabin, are stylish wash-basins going to fit your interior, are open shelves full of cosmetics going to be a decoration, or will it be better to hide them in cabinets? Stylish wood looks very interesting but requires maintenance, so if you are looking for an idea for a very practical bathroom, it is better to use e.g. classic tiles. 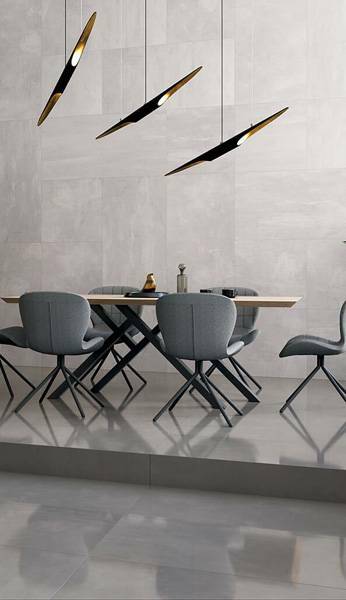 Ceramic tiles form large surfaces on the walls and floor, so their colour, pattern and texture affect the atmosphere and style of the entire room. For small bathrooms, bright colours are mainly recommended. It does not mean, however, that the wall must be dull and “boring”. Just use the decors or inserts that will make it more attractive. And again, it is worth to remember about the passing trends – so choose patterns that you find nice and that will not get boring in a year or two. 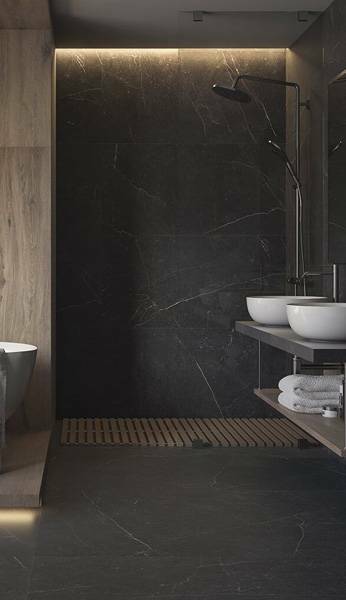 On the other hand, in a large bathroom, you can use the rule of contrast – dark and light surfaces adjacent to each other. Mosaic inserts will create a very attractive decoration. It is a good idea for both large and small bathrooms. Light tiles do not have to be boring! Delicate decorations or fancy structures can bring out the beauty of bright interiors. Maloli Collection, Ceramika Paradyż. When it comes to tile dimensions, the large ones (e.g. 60 x 60 cm) will create a uniform, quiet, and therefore optically larger surface than the smaller ones (30 x 30 cm). The appropriate arrangement of tiles also affects the proportions of a room – rectangular tiles arranged crosswise the bathroom will widen it optically, and arranged lengthways – will lengthen it. During the renovation, it is worth thinking about the change of lighting. If you decide on spot lights on the ceiling and near the mirror, as well as side lighting in form of wall lamps, they should have independent switches. Using the light, it is possible to create the right atmosphere in a room, as well as to separate individual zones. The bathing area, i.e. a bathtub and/or a cabin, should be separated from the area containing a toilet and a washbasin. During the renovation, it might be a good idea to put up a partition wall, even a low one, which will optically separate the annexes. If this is not possible, you can use colours and patterns of ceramic tiles to separate the areas. 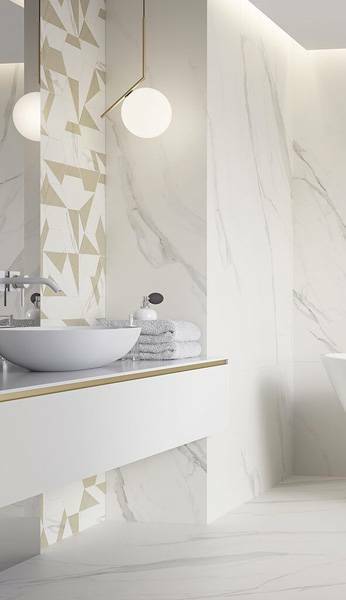 Part of a wall covered with tiles of different colour or pattern will help to optically create annexes in the bathroom. 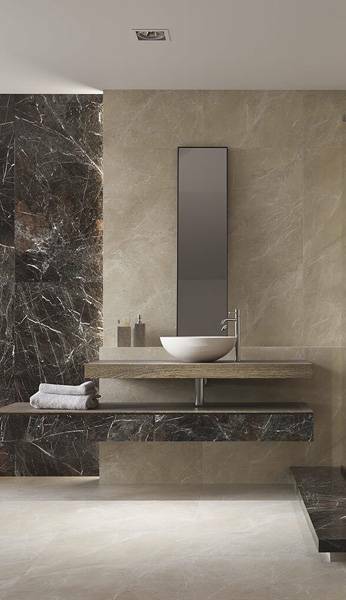 Using contrasting tile colours is a good idea for optical separation of areas in the bathroom. Esten Collection, Ceramika Paradyż. The renovation is also an opportunity to hide the washing machine. It would be perfect if you could create a separate mini-laundry – a niche or an enclosure for the washing machine, with room for cleaning agents, laundry detergents, etc. Remember that an enclosed washing machine should have about 10 cm of free space in the back and 2 cm on the sides. An electric socket must be close, so you will not have to use extension cables. One of the top solutions, besides typical corner shower cabins, are cabins without thresholds, called walk-in cabins (more information about this type of a solution can be found here). They are open cabins, that is with a flat shower base or with a profiled floor covered with tiles and with enclosures made of glass panels without any moving parts or doors. This solution is very functional, and the cabin becomes almost invisible. The entire bathroom floor, including the shower cabin, is covered with the same tiles – it makes the cabin almost invisible and does not limit the space. Segura Collection, Ceramika Paradyż. Large free-standing bathtubs are a popular trend in the bathroom design. Therefore, if you have enough space, it is a luxury worth considering. Models of such bathtubs give the interior a very elegant look. They create an atmosphere of luxury and look good in bathing rooms. They can have a modern, minimalistic look or resemble a retro style. A free-standing bathtub is an ideal addition to a delicate, romantic interior of an elegant bathroom. Antico/Arke Collection, Ceramika Paradyż.